Chicken Tikka recipe by Shamaila at DesiRecipes.com. 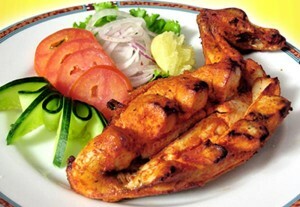 Chicken Pieces marinated in flavorsome spices and then grilled/baked. Taste great with raita and salad. Put in a blender and make a paste. Make 4-5 deep cuts on each side of the chicken pieces. Coat the pieces with the paste and leave to marinate for few hours. (preferably overnight in fridge) then BBQ or bake in oven. 45 red chilli.........oOOOo & 34 green chilli,, to garam masaly ka kia kusoor hai UFFFFF kese se koi badla lena hai kiaaaaaaaaaaa??????? ?